This fiendish-faced Puppet Digimon is a far cry from Monzaemon. It's on good terms with Metal Etemon, and it is said that the Waru Monzaemon plush toy it wears on its waist is something that Waru Monzaemon sent to it. Still, similar to Monzaemon, its true form is unclear, but the peeking out of its strange, shining eyes from within is eerie. Its personality is the epitome of wickedness, and it is malicious and treacherous. 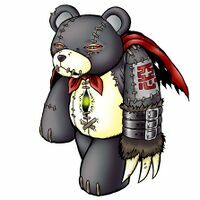 Its left arm is equipped with the character "Evil" and the powerful "Bear Claw" of a grizzly bear. Its Special Move is giving everything a dark mood and depressing them (Heartbreak Attack). If you suffer this attack, your feelings become dark and sorrowful, and you completely lose your fighting spirit. | Waru (悪) means evil. | Monzaemon is a pun. There was a playwright named Chikamatsu Monzaemon in the 17th century. He wrote plays for the bunraku (puppet theater). Heartbreak Attack  ハートブレイクアタック Hātobureiku Atakku Heart Break Hit/Heart Break Attack With the broken hearts it sends out, it steals its opponent's will to fight back by making them cry uncontrollably. Slashes or stabs at the opponent with the metal claws on its arm. Modifies the size of its claw. Nasty Step  ナスティステップ Nasuti Suteppu Party Time/Nasty Step Performs a strange dance and shoots an eerie light from stomach. 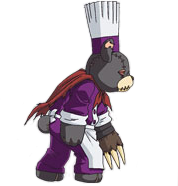 Waru Monzaemon was a minion of the Dark Master Mugendramon appearing in the episode "Farewell Numemon" He was in charge of the enslaved Numemon to work under the city cruelly forcing them to power the city by manually turning turbines. Sora, Takaishi Takeru, Yagami Hikari and their Digimon discover this but are afraid to try to stop him because their Digimon were too weak to evolve at the time. Waru Monzaemon spots them and chases after them. While he is pursuing Sora and Takeru, Hikari awakens some of her hidden power and frees the Numemon from their chains. He attempts to hit them with Bear Claw attack but they dodge it and his paw gets stuck in the wall for a moment giving Sora and Takeru a head start. Waru Monzaemon then roles up into a ball and tries to crush them. Sora's Piyomon and Takeru's Patamon seemingly gain the ability to fly faster from Hikari's light allowing them to out run Waru Monzaemon. They end up back where the Numemon were. Waru Monzaemon was enraged to see the Numemon freed and demanded to know who released them, Hikari boldly said she had. Waru Monzaemon moved to attack her but the Numemon jumped him. In spite of their spirit they weren't able to do much more then irritate him. Hikari began to flow more at seeing the Numemon defeated giving Piyomon, Patamon, and her own Tailmon the energy to evolve into Birdramon, Angemon, and Angewomon. As the three attacked simultaneously with Meteor Wing, Heaven's Knuckle, and Holy Arrow, Waru Monzaemon retreated into the next door and slammed the doors shut in an attempt to block the attacks, but they shattered the door blasting Waru Monzaemon away. Waru Monzaemon reported to Mugendramon via a video link, but when Mugendramon found out about his failure he executed Waru Monzeamon by self-destructing the room. When Oikawa randomly transported Digimon to the real world, a Waru Monzaemon appears as one of the renegade Digimon in the Real World, at Osaka Palace in "Everyone Advance Out! Imperialdramon". In "The Meaning of Parters! Renamon Evolves" A (shadowed out) Waru Monzaemon was among the Digimon seeking to become Ruki's partner in a flashback. In "The Order to Capture the Digimon! The Sinister Foreboding" a Waru Monzaemon was seen on a computer game Terriermon was playing. After the Chosen Children arrive onto a floating island called Toy Town in "Town Floating in the Sky! Toy Country of Toy Agumon" a virus Toy Agumon told Monzaemon to fight the Chosen Children and Monzaemon said he didn't want to the Toy Agumon transformed him into Waru Monzaemon. He kidnapped Tomoki from Takuya and Kouji, who tried to pursue him, but he used his Heartbreak Attack to fill them with sadness. He takes Tomoki to a pink castle but there Tomoki was able to remind Monzaemon of who he really was, causing him to revert back to normal, much to the surprise of Takuya and Kouji when they came to rescue him. Waru Monzaemon is a troublemaker in Toy Town that kidnapped a Hagurumon. To enter the room and fight Waru Monzaemon, the player have to evolve Numemon to Monzaemon by touching a mysterious costume. 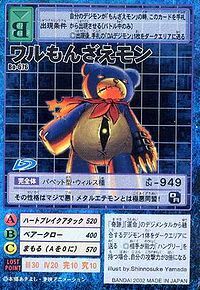 Waru Monzaemon is also an obtainable card with a high price. Waru Monzaemon is a Land-type Variable Digimon that can be learned with a combination of Pico Devimon and Nanimon. Its Heartbreak Attack decreases PP for all enemy Digimon. 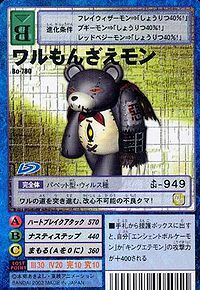 Waru Monzaemon is a Perfect-level Darkness Digimon card. 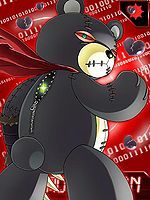 Its Special Attack has a Jamming effect and Support Effect is doubles own Digimon's Attack power, but own HP becomes 10. 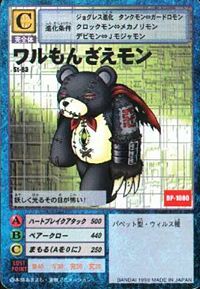 Waru Monzaemon is an obtainable Digimon by evolving Hyougamon with 0+ JP (Jogress Points). It can evolve to Metal Etemon with 0+ JP. Waru Monzaemon appears as an independent enemy at Serial Hole (1), Resist Hole, MIMD Hole, Reverb Hole, Cluster Hole, Spool Hole, Core Tower and Chaos Tower. 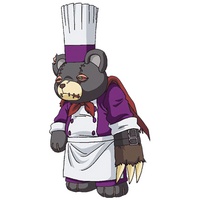 Karen Bates uses him in the Coliseum alongside Megadramon and Tekkamon. Waru Monzaemon appears as an enemy in Trap Crevasse. Waru Monzaemon harasses a girl named Lisa in the Sewers of Asuka Server, but when he is defeated by Atsushi he stops and apologizes. After the main storyline, Waru Monzaemon can be fought as one of Xuan Wu Leader's Digimon in Tyrano Valley, only if Atsushi has all 5 Epic Items in his possession. 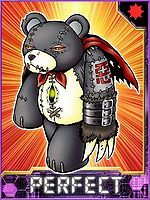 Waru Monzaemon can be obtained as a Perfect-level Black Digimon card with 26 AP / 22 HP. It is a NPC Digimon appeared at the DigiCentral during Angewomon's Onegai Quest. It is not obtainable and cannot be evolved from any Digimon. It is an obtainable Digimon, evolving from Orgemon, Garurumon, Leomon or Lekismon and evolves to Pinocchimon. Waru Monzaemon is available as a Digimon Medal. Obtained by Jogressing Tankmon, Clockmon, Guardromon or Mechanorimon with a compatible Digimon. Can Jogress to Mugendramon with a compatible Digimon. Obtained by Jogressing Thunderballmon, Clockmon, Guardromon or Mechanorimon with a compatible Digimon. Can Jogress to Venom Vamdemon with a compatible Digimon. Evolves from Kabuterimon, Centalmon or Tyranomon. 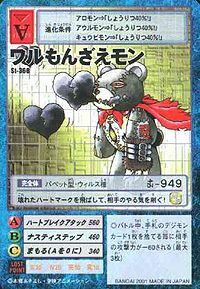 Waru Monzaemon is an unobtainable Leader Digimon. Its magically shining eyes are frightening! With the broken hearts it sends out, it steals the opponent's will to fight! Its personality is downright evil! Together with Metal Etemon, they are a heinous duo! 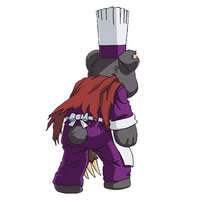 Pressing onwards on the path of evil, it is impossible to make this delinquent bear repent! 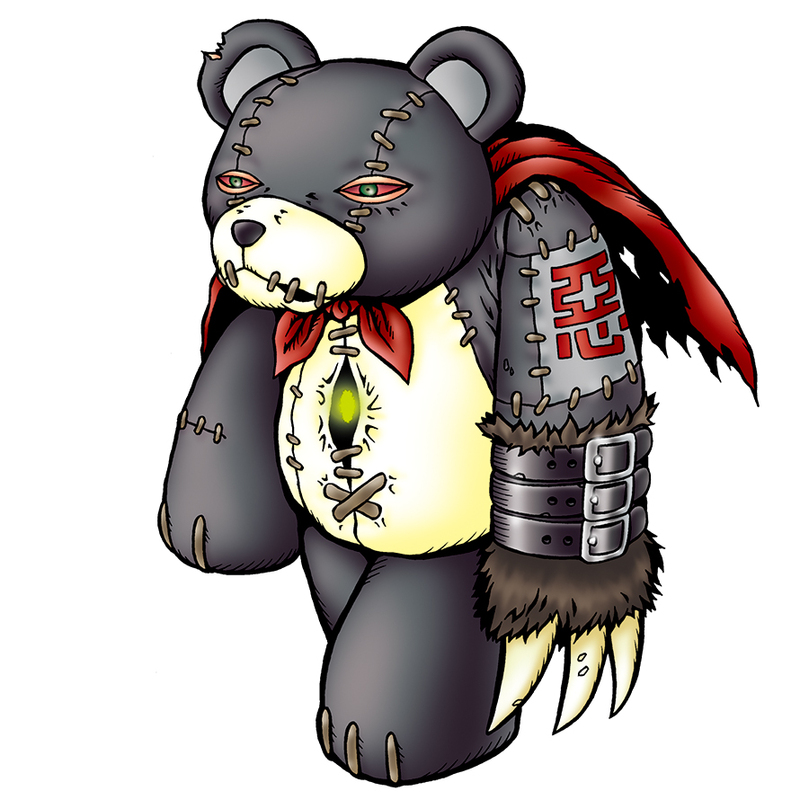 A fiendish Digimon that is a far cry from Monzaemon. 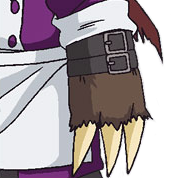 Its left arm is equipped with the Bear Claw. 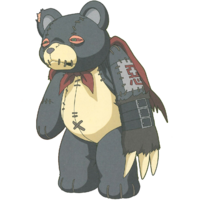 It is on good terms with Metal Etemon, to whom it has gifted a plush toy of itself. This page was last modified on 10 April 2019, at 18:55.